I wore black to my second wedding. I wasn’t trying to make some kind of statement that I was damaged goods because I was getting married a second time after a divorce. I had been looking at maternity wedding dresses on ebay, but buying a dress to wear one time seemed like an extravagance we could ill afford at the time. Besides, we hadn’t picked out a wedding date, so there was no rush to find something that I could wear. Part of my hesitancy was that the wedding felt strange to me. It was going to be completely different from my first wedding. This time I was pregnant. This time I was marrying someone who not long ago had been someone else’s husband. This time I wasn’t going to be surrounded by family and friends. There wouldn’t be a minister. There wouldn’t be music. There wouldn’t be toasts. There wouldn’t be dancing or bubbles or glasses clinking to make us kiss. It was just going to be us in a courtroom. At the very least, I wanted a new dress. Some small token that would mark the day as special. We finally decided yes, we would marry in the next two months. Sometime before the baby arrived, because we wanted both of his parents to share his name. With teaching and time with the kids, finding a few hours to get a license and a judge was hard, so we figured we would split it up. Go get the license one day, and then actually do the ceremony at another time. The license was good for 60 days, so we had time. I could still order a dress. It would be okay. The day could still be special. And despite all of my hesitations because of the differences between this wedding and my first, I knew that I didn’t want to wait any longer to be his wife. I was in love with this man, and I didn’t want to wait another day to be married to him. Our families weren’t with us, but they all sent congratulations and love to us. There wasn’t music, but as we shared with our friends in a Facebook group, they sent us videos of all of the terrible and fantastic music they had chosen for their weddings. 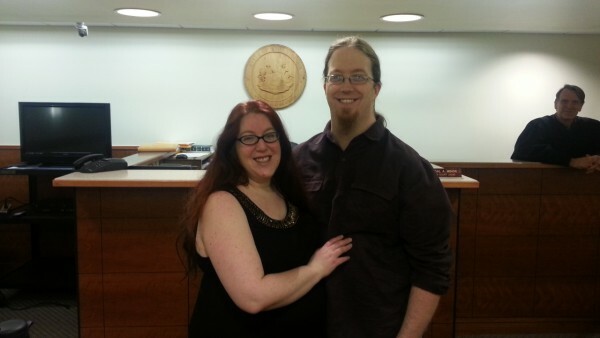 There wasn’t a minister, but the judge was kind and the witnesses took our picture with my phone during the ceremony. There weren’t guests, but our tiny son who was just starting to make his presence known squirmed contentedly in my womb. As I looked through my closet, trying to find something to wear, I pulled out a black dress. It wasn’t new, or something that I didn’t wear often. It was actually a frequent part of my wardrobe. Which was part of why I chose it. Whenever I would put on this black dress, I would remember the vows that I made, I would remember the way that Rich looked into my eyes and promised himself to me, and how I did the same for him. That dress was not what made the day special, but instead, the day made my black dress special. This entry was posted in Marriage and tagged divorce, marriage, remarriage, wedding. Bookmark the permalink. You both look like you are in love. Which of course you were/are. And that’s the very best thing to “wear”. Thank you, sweet friend! There is much love here.